Orvis have applied modern taper design principles to a classic rod building material to produce a fibreglass fly rod that is smooth and slow, yet crisp and strong. 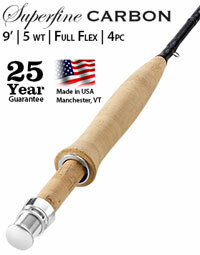 The Orvis Superfine Glass fly rod throws dry flies with a balanced touch and can even sling streamers when necessary.  Unsanded graphite blank with matching graphite wraps.  Delicate presentation and subtle feel.  Modern construction results in added strength and smoother casting.  Silver snake guides and hardware.  Up-locking cork and polished silver reel seat.  Aluminum rod tube with cloth rod sock.